Our apps have generated $1.2 Billion in additional sales for over 200K Shopify stores since 2015. Our apps are focused primarily on growing your revenue and store. Join stores doing the same. Save countless hours in managing processes and complicated systems. Our apps do that for you! Unlike other apps - get setup within 2 minutes and watch your conversions skyrocket. Gain a huge advantage over your competitors by putting your store on overdrive. Our apps have proven results and have made over 1 Billion dollars for Shopify merchants. Not only will our apps supercharge your sales - but you will earn back time to do what really matters.. Working on your business. 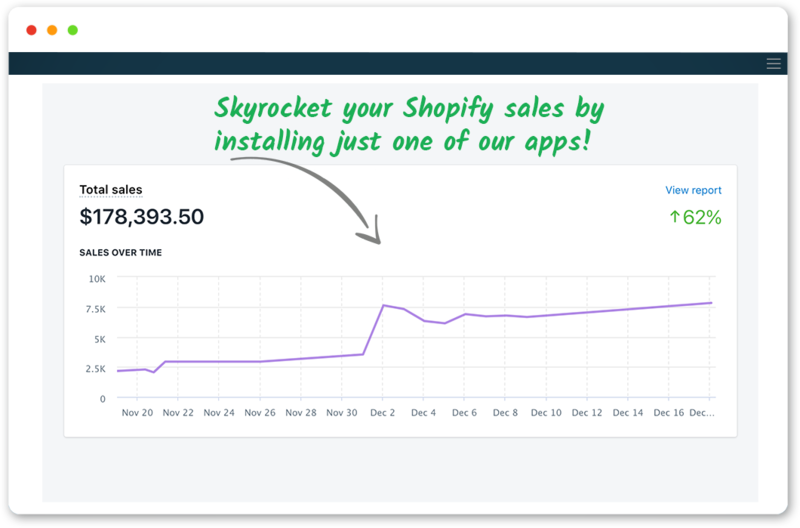 Skyrocketing your Shopify store with high growth apps.